I am trying to learn more about Relational Databases and I figured there is no better way to learn then to actually do something. I decided to make a personal attempt to look at Personal Budget Accounting and Forecasting. 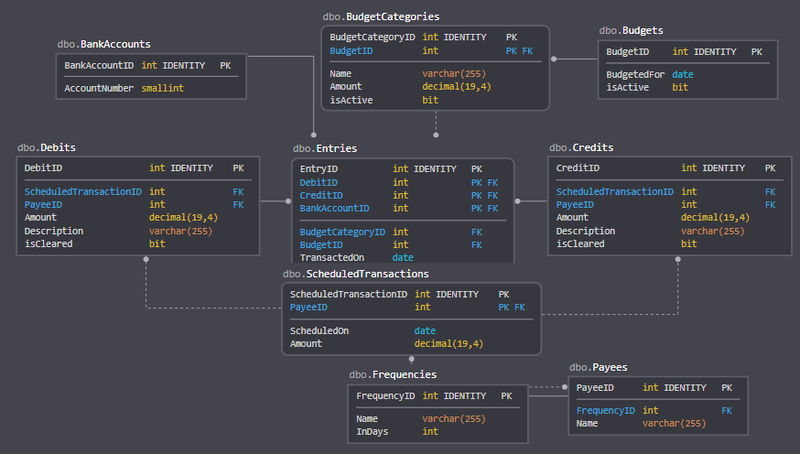 I have done some research thus far and would like to get some insight on my current Database Design and Normalization. Disclosure: This is a personal project. Not for homework or for work. I figured it would be helpful to know WHY I did something so you can understand my logic and reasoning. Each Budget can contain more then 1 Budget Category. I added an isActive column on both Budgets and BudgetCategories in case I wanted to reactivate a different budget or budget category. I separated transactions into two very much alike split tables Debits and Credits as I saw there was two types of transactions. In order to allow and track Scheduled or Reoccurring transactions I created a ScheduledTransactions table that allowed me to have two different amounts, an expected amount in ScheduledTransactions and an actual amount in either Debits or Credits. I figured each forecast would need a start and end date as well as a starting balance. Each day would need to be forecasted to be able to determine the sum of Debits and Credits. I think I could have used the other tables and added a few isForecasted Columns and it would have worked the same. I decided not to go that route in order to decouple the two in case any changes would need to be made as well as if this was a large scale application reading and writing large forecasts into the same tables as actual transactions I would think would cause a log of performance issues. I would identify the payees, in terms of budget and type of account. Say you need to list or consult the payees. I would also have an active column for payees. It could be nice to know what account pays what budget in the future. Who am I paying the most? Did I pay the sewage-hauling bill this month? What are my cash requirements for this month? Will I need to go out and kill stuff for food? The nature of these questions should drive the design of the schema. 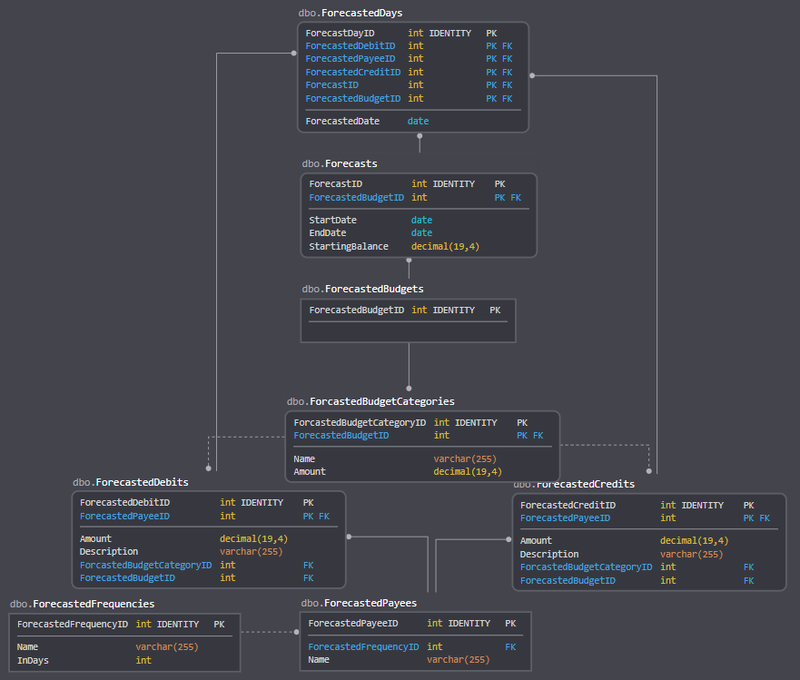 That said, this schema looks pretty good. I agree with the idea that the debits and credits could be in a single table. Not the answer you're looking for? Browse other questions tagged sql-server database-design best-practices or ask your own question. How to design a database for financial bond prices?